Hi, my name is Laila Delfi. My beloved sister, Maryam, and I are members of the Iranian Resistance. We come from the beautiful city of Ahwaz in southern Iran whose people are famous for their hospitality, exuberance, and livelihood. Unfortunately, I hardly tasted such feeling of joy in my family as the Iranian regime treated us and other families like us harshly with imprisonment, torture and slaughter of our loved ones. They silenced every voice that sought to be free and did not succumb to their tyranny. My elder sister, Sakineh, was one of those who did not remain silent and did not turn a blind eye on oppression. Not only she was an older sister, but she was also kind as a mother and caring as a teacher to me. Her heart was filled with love despite great pain that she concealed from us. She felt for the poor kids of oil-rich province of Khuzistan who had stay in the streets all night and day in the freezing cold of winter and in the scorching heat of summer. She felt the pain of bereaved mothers, elderly fathers and deprived workers who lived in misery despite the fact that our city was surrounded by oil pipelines and oil and gas refineries. Nevertheless, she always had a smile on her face. She was full of hope for a future of freedom. And for me, she was the example of a unique human being, a role model in patience, tolerance and firmness. 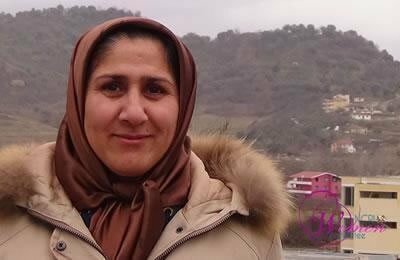 Sakineh was arrested and imprisoned many times but nothing could shake her resolve in continuing her path and her activities. She was ultimately arrested for the final time in 1987 as she was leaving the country to join the Resistance. She was 24 when she was hanged in summer 1988, among the 30,000 political prisoners who were massacred that year. At that time, I was 16 and her death weighed very heavy on my soul. In those days, I was a “courier” who took messages to political activists and families of political prisoners. I took the statements and news of the Resistance movement house to house. Being a courier was my mission in the path of freedom and I did it with all my love for freedom. Although the news of Sakineh’s execution was truly painful to me and I cried deep inside but I could also hear her voice echoing in my ear, encouraging me to continue her path and giving me further strength to move on with more determination. Shortly after Sakineh’s execution, I did my best to leave the country and join the Resistance movement. In those days, it was kind of strange for a young girl to leave the country on her own, but I had made my choice, so I just took off. Now, when I look back to that moment, I can see that I found confidence to solve all the problems in this path, from the moment that I made my choice. This is what filled me with energy and made me powerful in confronting any problem. This time, I was a courier who carried not only the message of freedom, but the message of the steadfastness and grim will of my brave sister, Sakineh, to continue her way to the end. I had become a true messenger of freedom. And this is my experience and my message to you.